Which should come first, people or profits? 02 Nov 2017Which should come first, people or profits? As the owner of an Accountancy firm I need to make sure the figures stack up. We spend a huge amount of time budgeting and forecasting. We’ve set ourselves a challenging growth curve and we know we’re on track to get there. Last year we grew turnover by 67% and we’re still on that trajectory. Is this because we keep an eye on every penny? Maybe, partly. But what we do know is that those figures wouldn’t look so pretty without the team behind them. So, for me it’s absolutely about putting people before profits. Because if you get the right people on the bus, in the right seats, then you can go anywhere. If you were at Xerocon London this year then you’ll know that machines are going to take over the majority of our workload. You’ll also know that whist machines are vastly more efficient and accurate than we are, they are rubbish at some jobs. People, the right people, excel at relationship building, reading and understanding emotions, delivering business advice and tailoring this to each different person. The figures need to stack up but it’s the people who make a business and this is where your focus needs to be. As the saying goes: “People buy People”. On average we spend half our waking hours at work. 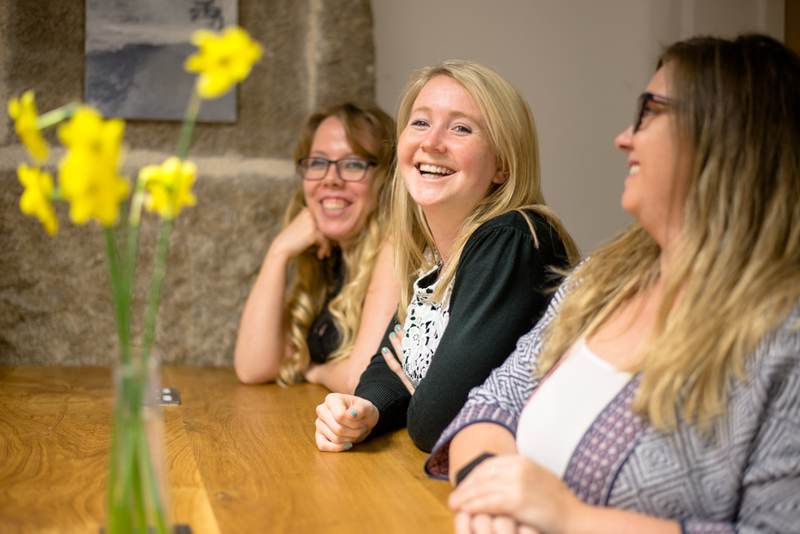 We look for ambitious, motivated people to work for us and this type of person isn’t going to waste half of their waking hours sitting in an uninspiring office. It needs to be a great place to work. That means comfortable chairs, the latest computers, space, good lighting, the right temperature, healthy snacks and drinks always available, areas to sit, stand, take a private call or hold a meeting. At the very least people need to be comfortable, ideally the office is a space they are very happy to spend time and proud to work in. Office culture is also hugely important to getting and keeping the right people. A team needs to be a team in and out of the office. Each person needs to know that not only will your colleague help you with that tricky excel doc but that you can call them anytime if you find yourself in a sticky situation. At The Peloton we have lunch together every day, cooked from scratch by one of the team (we take it in turns). So the lunch thing isn’t going to be feasible in every office but a Whatsapp group to share news, photos, tips or absolutely anything else is. It’s basic human nature to want to feel part of something. We are very open with everyone about our growth ambitions and the part they play in that. We make each person accountable by giving them individual targets and a regular platform to report back on what’s worked, what hasn’t and what we need to keep an eye on. Each person in the team is responsible for something and the buck stops with them on that. This isn’t about catching people out, it’s about motivating them – believe me it works. If targets are met or great work is done make sure it’s not only noted but openly congratulated. Success quickly loses it’s appeal if it’s not celebrated. It also needs to be okay to fail. We were all inspired by Matthew Syed’s Xerocon talk on Black Box Thinking. If people are scared of getting it wrong then there will be no innovation. It’s an overused phrase but it’s true. A short, snappy morning meeting allows each person to raise burning issues and focus on their most important tasks. Managers need to be available to answer questions and listen to feedback. If time management is an issue then have set ‘have you got a minute’ / answering emails times during the day to avoid distraction. The idea that we will all work to the best of our ability if we are in an office between the hours of 9 until 5 dressed smartly is at best archaic. Whether it’s because they want to avoid the traffic or they can think more clearly when they get up early and work from home in their pyjamas, wherever possible let people make work work for them. Well behaved dogs are more than welcome in our office, as our pyjamas.